Photo taken at Carsington Water on Tuesday 28 June 2018. The club has a social gathering and planning meetings on Monday evenings and rides are held on Tuesdays, Thursdays, Saturdays and Sundays. Riding is what the club is all about. There are two midweek rides which start at the Wheatbridge Cafe, one established Saturday ride, from Baslow, and a Sunday ride which meets by the cafe in Queens Park. Keep an eye on this website for developments. Non club members are welcome to join us on a tryout for up to 3 rides, by which time they have hopefully decided to join us. Insurance dictates we stipulate this condition. Also, for insurance purposes, riders are recommended to join either the CTC or British Cycling. Alternatively, members can become group affiliate members of Cycling UK under the club’s group membership, contact the Secretary. 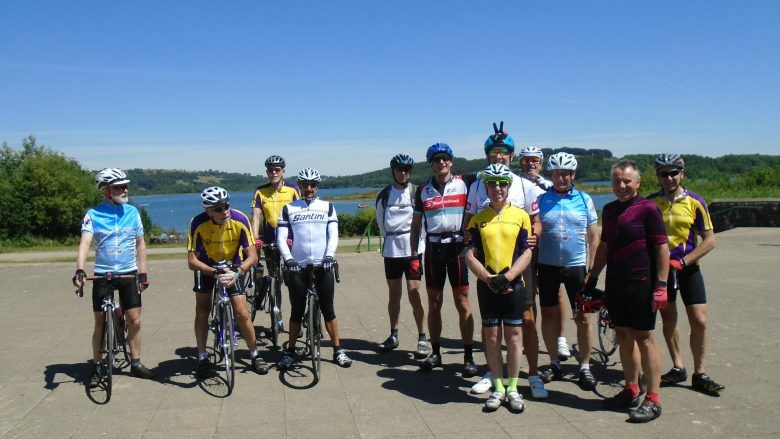 If you are a visitor to the area please make contact and join us on a ride (see contacts page). Members usually ride ‘tourer’ or ‘audax’ road cycles, some ride hybrids and we welcome electric bikes. As long as it’s roadworthy and properly maintained anything goes – you might struggle on a full suspension mountain bike – horses for courses. Be equipped with at least one spare tube, pump or inflator and basic tools. Some may carry spare cables, chain links, etc. You will need lights as the nights draw in – it’s all too easy to be caught out unlit at dusk. Most importantly, you will need a water bottle, an emergency snack or banana and some money for the cafe. It is also useful to carry identification, details of any medical condition and a mobile. Lycra is not necessary, many do because it works. The Club kit page explains why we wear the colours we do and how you can too. Layer up, as you warm up, you can unlayer. In winter some members wear reflective ankle bands and other items to increase their visibility on the road. Helmets are not obligatory, photos show the general consensus. One member’s view is expressed on the page Etiquette. These aren’t club rules but form good guidance. The most important thing is to have an enjoyable ride in good company within the fantastic landscape we are privileged to inhabit.